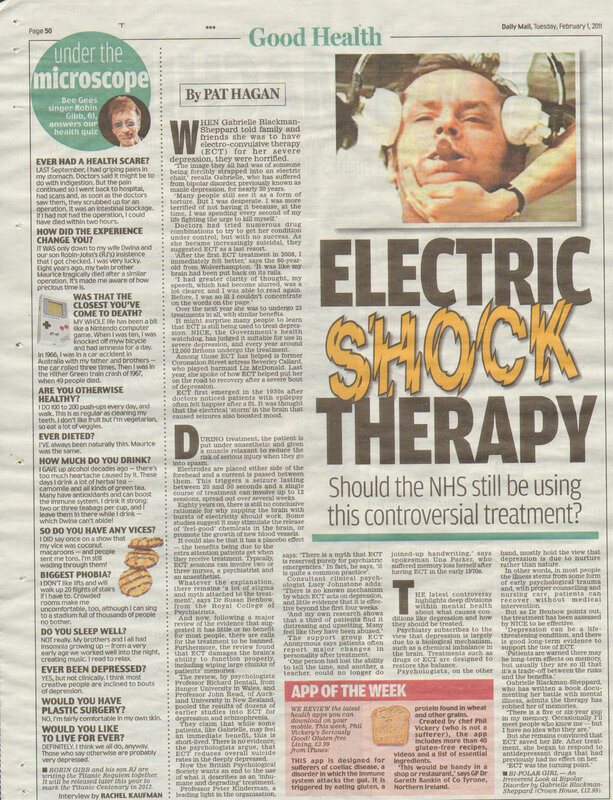 Following the article that was published in The Daily Mail Good Health section and in which I was interviewed, I have of course been asked a lot of questions about ECT. People always assume that I am a 'proponent' of ECT. That is simply not true. I am NOT in favour of zapping people willy-nilly at the behest of an irresponsible monstrous psychiatric conspiracy! I tell my story - that's all I have to offer, and I will not be intimidated by the rabid reactions that inevitably ensue the mention of ECT. So where do I stand on this important issue? The treatment MUST be for the benefit of the patient and NOT for the comfort and ease of psychiatric staff. Any abuses that have taken place in the past are simply and shamefully unacceptable. The treatment must be administered in line with the rigourous standards imposed by ECTAS and every aspect of the medical process must be trackable and verifiable. ECT MUST BE THE LAST RESORT when the suffering (and by that stage desperate) patient has responded to NO other treatment, and as much as is possible, the patient (and his/her family if appropriate) must be involved in the decision-making process. The potential side effects of the treatment must be clearly explained to him/her and the effects on the patients as the treatment progresses must be carefully monitored. Anything less is unacceptable. There was nothing barbaric about the ECT I received. How can psychologists talk about the benefit of ECT being nothing more than a placebo effect and yet talk about the same treatment as being near torture? I have never known barbaric abuse to have much of a placebo effect, have you? I actually wish I had asked to be filmed while I was receiving ECT. I think it would do everyone the world of good to see what going through ECT is actually like. Because of the short term 20 minutes anaesthetic a lot of people find going to the dentist more unpleasant! Thirdly, arguing that ECT does not have a lasting effect on lifting severe depression is missing a very important point: ECT does have a life-changing/saving effect when a patient whose depression was hitherto resistant to all medication suddenly starts responding to drugs. As I always put it, ECT put my little 'brain train' back on it rails so that I can now take medication to stop it behaving like a runaway train. By the grace of God, my brain has never derailed since. Fourthly, NICE (the government's health watch dog in the UK) tells us that every year around 12,000 patients are treated with ECT. Let's assume for a moment that three quarters of those people (or members of their family) cannot communicate with the outside world at all (a wild exaggeration on my part! ): it still leaves 3,000 people who are mercilessly tortured and traumatised every year. They are remarkably silent in an age where the popular media would only be too happy to print stories such as 'I had ECT and I cannot remember my name' or 'I had ECT and keep jumping into bed with the wrong man because I can't remember who my husband is', etc, etc. You get my drift. Fifthly, plenty of dreadful things have been inflicted on people in the name of medical progress (radiation experiments being one example) so psychiatry is unfortunately no different in this regard. Where it is very different is that by and large physical medicine operates 'in front of the curtain' so everybody can usually see what is going on. Psychiatry on the other hand has a long history of operating 'behind the curtain' in those terrible places that used to be called lunatic asylums. Calling them 'psychiatric hospitals' hasn't helped much. There is still suspicion, fear, terror even, attached to psychiatric treatment. It needs to move into the mainstream of understanding so that people are less afraid of it. For me, humor is a great diffuser of fear which is why I use it liberally in my writings and when public speaking. Of course, humour is never mockery. I laugh at myself with my illness - I do NOT mock people who are mentally ill or disabled (I believe the politically correct language for 'mental disability' is 'learning difficulties but it all adds up to the same thing. Besides most people - even in the medical world - are unable to tell the difference between having a mental illness and having learning difficulties. We still have a lot of work to do to educate ourselves...). Current 'turf wars' between those three areas may serve medical egos but the price is ALWAYS paid by suffering patients and their families. Instead of endlessly arguing about whether nature or nurture is at work in mental illness, why not recognise that both are. I wish with all my heart to see more and more inter-disciplinary collaborative initiatives to help alleviate patient suffering. ECT treatment does have side effects - I don't know of ANY psychiatric treatment that doesn't - but that should not automatically consign it to the realm of barbaric torture. It came about because doctors noticed there seems to be a sort of 'biological incompatibility' between epilepsy and schizophrenia, and epileptic fits have been repeatedly observed to lift depression (at least for a while). In ECT a very small amount of electricity is used under short-term anaesthetic to provoke such a fit under a highly controlled medical situation. That's where the idea came from. It was never designed to torture anyone but to relieve suffering. The crux of the matter is this: if my beloved son's condition suddenly became drug resistant and he ended up in the same terrifying excruciating state I was in (heaven forbid!! ), if he was offered ECT to relieve his pain I would ensure that he had all the information he should have about the treatment and, although I would never push him towards it, I would not stop him either. And that's the truth.